I pulled over between two one-lane bridges to take pictures of the rail. Melani waited in the car, as she does every time I do this. I have a lot of pictures of tracks. They’re all different, at least to me; I can tell you the difference between Upper Canada Village rail and Amherst rail. “Do you want a picture of the ‘Active” sign?” she asked. I should have taken a picture of the Active sign. The Englewood Railway is 100 years old. 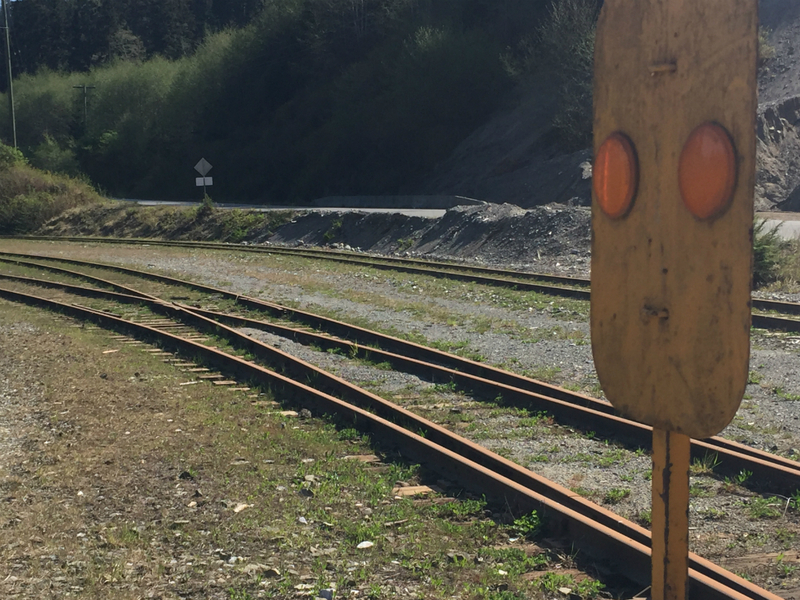 Eventually it would run 90 kilometres from Vernon Lake to Woss to here, Beaver Cove, and at its height boasted 350 logging cars, running 40 at a time, but until the 1950s, the track was interrupted — logs would be loaded onto trains, transported across Nimpkish Lake, then reloaded to be hauled the rest of the way. It is a winding, slow route that crossed wooden bridges, then steel ones that could also support logging trucks. Each of its cars carried enough rich Vancouver Island wood to build an entire house. Then, a little more than one year ago, 10 loaded cars got loose and rolled down the track near Woss. They hit a maintenance car and spilled their logs, trapping three people beneath the load. A 27-year veteran of Western Forest Products and the son of Woss’s fire chief died at the scene. The third worker died of his injuries at a hospital in Vancouver. No criminal charges were filed in the accident. In November, Western Forest products shut down the line, claiming the tragedy wasn’t behind the decision. Of the 34 employees, Western Forest said only 15 would lose their jobs and that the rest would be offered work elsewhere in the company. However, an area resident says 25 people ultimately were unemployed. The Englewood line was the last logging railroad in Canada. Its track cuts across the bumpy road to historic Telegraph Cove, where the Active sign cautions drivers. But I don’t have a picture of that. “It’s obviously active,” I said, and got back in the car, admiring the silhouette of the last rail bridge before the flat open space where thousands of logs are piled, waiting to be loaded.